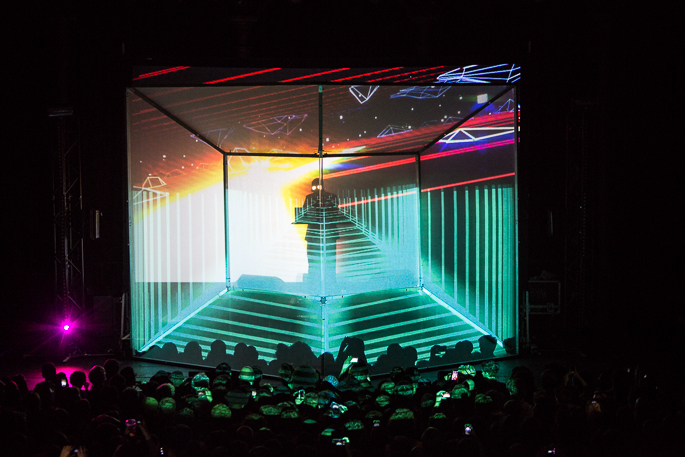 Flying lotus delivered yet another unbelievable performance, this time in the magnificent Camden Roundhouse. With Kode9 DJing to open and Thundercat in support I would of gone home a happy man with just that. I have seen Thundercat a number of times now and if you don’t know then I highly recommend you get to know. The trio are all astounding musicians, but Stephen Bruner (AKA Thundercat) is a whole new level. The bass maestro takes it up another notch each time you see him perform! I was particularly chuffed to finally hear them play ‘Heartbreaks + Setbacks‘ live as well as hearing ‘Lotus and the Jondy’ again (See below video to hear this). A truly captivating and brilliant performance is delivered every single time. As soon as he took to the stage and the box lit up the entire audience were in awe and amazement. The visuals from Dr. Strangeloop & Timeboy proved to be magical and spellbinding. Leading up to this gig I was worried that after seeing Amon tobin’s live ISAM show any other visual performance would appear dwarfed and inadequate and this was far from the truth. I’m not going to try and describe it further because I really can’t do it justice. Everybody should get tickets for the next Flylo show in April at Brixton Academy. It will sell out for certain so don’t sit on it, just get them!! This very shaky video will give you some idea of what I was stood in front of…. And here are some great photo’s from the event over at Fact Mag - www.factmag.com Unfortunately I didn’t manage to take any pictures or video myself as I was far too busy having my mind twisted by the whole experience.